I feel sick. The constant news cycle. The pictures and videos. The soundbites. The unequivocal, unapologetic, urgent call for hatred of people whose skin is a different color. I think I’ve always been bothered by the unfair treatment of people who aren’t white. I was raised on Sesame Street-style diversity and after-school specials that called out bullies and bigots. 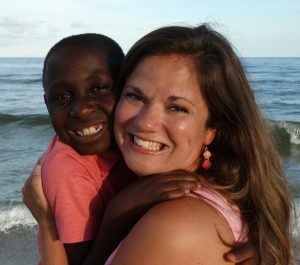 But now that I’m a mother to a beautiful, brown-skinned boy, I can’t just turn off the TV and stay in my white privilege bubble. Though you could argue I should’ve felt this strongly all along, for me, there’s a new reality to the recent violence. With the addition of our son to our family, I now replace every mistreated, overlooked, belittled black person with his face, his eyes, his tears, and I am undone. When I see a picture of a torch-bearing white supremacist, I can’t help but think of how this man hates my son, even though they’ve never met. How to keep him safe? How to teach him when to stand up and when to stand down? How to keep moving forward when there seems to be so much hate? I can’t think of what to do except to go out and love on people. Yesterday in the parking lot of Sam’s Club, I watched an older white man approach a black mother of four small kids. I held my breath. I braced myself. Then I heard him say that her children are beautiful and a blessing and can he get her a shopping cart? It was commonplace and magnificent, all at once. It was regular kindness, a step towards healing. Kindness promotes trust. Trust makes room for understanding. Understanding creates empathy. And once we get to empathy it’s a lot harder to hate complete strangers. In that same parking lot, I saw a different white man, feet planted widely apart with hands on his hips, stare down a woman wearing an Islamic headscarf. Maybe he had lost his car. Maybe he was elderly and confused. I’m still not sure, but my senses were on high alert. I picked up my pace to walk closer to the woman, wondering what I would do if he said something unkind. Nothing happened. It was probably a scene created mostly by my imagination, but I was ready because I’m tired of letting others do the talking for me. I’m tired of all this hate. There’s no shortage of opinions when it comes to the recent events in Charlottesville. Everyone seems to have lots to say. I’m not in any way certified to speak about race relations, but I can’t say nothing at all. We can fight against racism. We can stand up for what’s right. In the space of one generation, we went from whites-only water fountains to an African-American president. Anything is possible. As long as there are people willing to call out bullies and bigots, there’s hope. I will not be silent. Let’s see the glory that remains where there’s an absence of hate. Nicely said but awesomely lived.